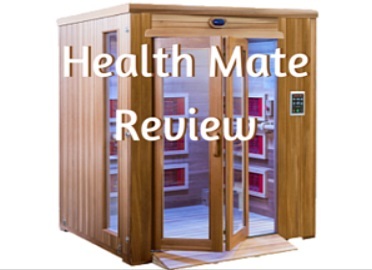 Health Mate Sauna Reviews - Are There Complaints? Health Mate Sauna Reviews – Are There Complaints? Should You Choose a HealthMate for Infrared? Your health is likely your most treasured possession and a Health Mate Sauna could be an excellent purchase to improve your health. Knowing quality infrared detox therapy is one of the best methods towards great health and a pathway to deep healing as well, you would do well to consider a Health Mate Sauna. We first researched Health Mate Saunas 6 years ago and have watched them with interest since that time. In 2015 the company upgraded its website and expanded its product line. Again in 2016, we again talked extensively with the company and researched how its new products have been received. As of November, 2018 the company is pushing forward with new leadership, again adding a new product and making changes to its entire website and marketing efforts. Many online Healthmate sauna reviews are basic facts from the company website simply repeated with no research or understanding of the brand. In direct contrast, we want this 2018 Healthmate Sauna review to save you hours of time and research. Note: As of November 2018, we suggest you strongly consider Heavenly Heat Saunas, which have 304 surgical grade stainless steel ceramic heaters, the best in the industry. 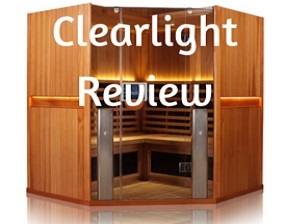 Heavenly Heat carries an excellent warranty and are the cleanest, purest saunas available. Currently Health Mate is undergoing a lot of changes. During the past 2 years it has again had leadership changes, is adding an entirely new product with unproven effectiveness and is again revamping its entire website. It now has a partially dedicated phone line for sales which sometimes goes to a PLH Products message about not having customer service available. Extensive 40-year History producing products and wood for dozens of companies in the industry. 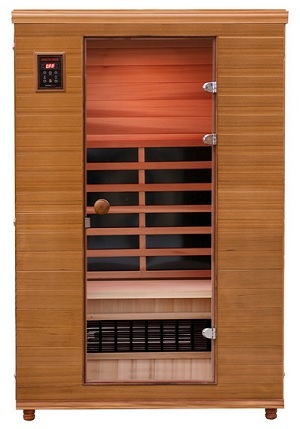 Healthmate Saunas have a patented UL listed Tecoloy heater while some models add standard carbon panels. Warranty is good with unconditional lifetime on their Tecoloy heaters. The TruInfra Heaters, controller, craftsmanship, power supply and LED lights have only 5 years coverage. We would like to see more components have lifetime coverage. In 2016 they expanded their one product line into several quality lines for all consumers. Not the lowest for this industry, EMF levels are acceptable and test results are posted on their site. Uses clean non-toxic wood from its parent company, PLH Products. These are beautiful wood cabins. Note: When calling Healthmate Saunas you may need to deal with a slightly cumbersome process. The number you dial on their website is sometimes the number of PLH Products, their parent company. PLH Products supplies excellent wood to numerous infrared companies around the world. When calling, Option 1 will take you to sales. Choosing option 1 a second time will take you into their infrared sales. I have suggested to them for the past 3 years that the parent company should implement a direct number for this division. As of November 2018, there is a direct number, but it often directs to PLH. But this shouldn’t prevent you from contacting them or considering this brand. Are Their Tecoloy Heaters Effective? How to Clean Health Mate Sauna? Are There Many Health Mate Sauna Complaints? Primarily, this company has long been known for excellent craftsmanship and for their Tecoloy Steel Ceramic heaters. Pictured above is one of the newer models which adds carbon panels and includes a ceramic heater under the bench. 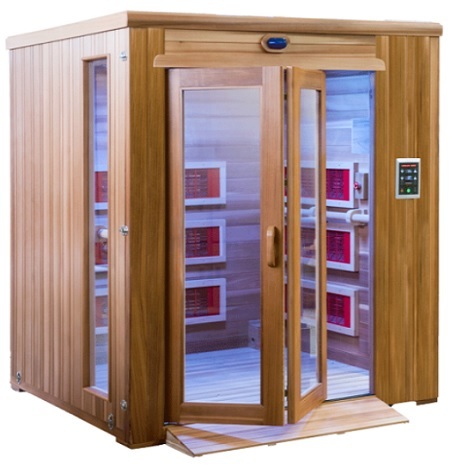 HealthMate Sauna Prices can be obtained by phone call or by online request. How much does a Health Mate Sauna cost? The products range from $1900-$6500. When you choose a HealthMate infrared sauna for your healing therapy, you are choosing over forty years of experience in research and production. The company is in the business of producing one of the better products you can buy. This dedication and focus is reflected in the rock solid A+ rating it has received from the Better Business Bureau. Building upon these 40 years of history, these are mostly affordable, as well as convenient to set up. They utilize true far infrared radiant heat to provide some of the best health benefits currently available. 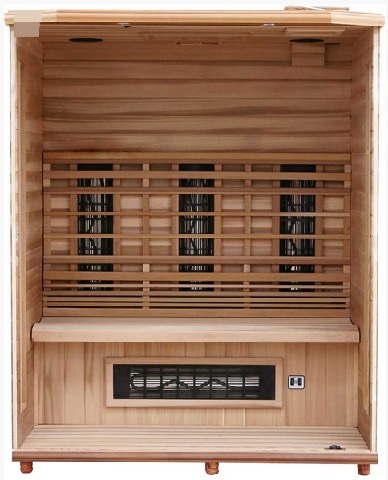 A Health Mate infrared sauna has been designed and assembled to comply with the company’s stated mission to strive for one hundred percent customer satisfaction. From top notch craftsmanship, original and fresh design, to good customer service, everything they do is aimed towards providing their customers with the best therapy experience possible. As a result of this, Health Mate far infrared saunas carry a lifetime warranty on their patented UL listed heating element. However, other components including the TruInfra heaters and power supply are covered for only 5 years. We would like to see the lifetime part of their warranty cover the entire product as the warranty on competing Clearlight does. However, this warranty does cover the expensive and most critical aspect of the product, the heating element, for your lifetime. This is a warranty that is one of the better in the industry. The company claims they avoid many of the weaknesses of the standard ceramic rods used by other companies. Standard ceramic heaters are known for higher heat and a quick warm up time. However they are also known for uneven heat and cool spots on the ceramic rods. Additionally, most ceramic rods are fragile with the normal effective life of these being around 5 years, industry wide. This fragile nature is often a result of the weaker sand filled pipes typically used in the heaters of most cheaper units. Instead, they take a somewhat standard ceramic heater and encases it in encoloy and adds an alloy and carbon based center to the rod. This process eliminates those cool spots in both the heater rods and the cabin space, providing the user with an extremely even heat normally absent from this type of heater. This is likely why these tecoloy low emf heaters carry a lifetime warranty – which is rare in the industry. A good warranty is something to strongly consider when making your purchase decision. So is there any evidence to back up the company’s claim? Health Mate Tecoloy® heaters are certified by Underwriters Laboratories. This means that they have been independently proven to be effective and efficient unlike many other ceramic-based brands on the market. This is because the patented Tecoloy® heaters provide their heat in the far infrared spectrum. Far infrared radiant heat is the best form of radiant heat to penetrate the human body to a depth of two inches and provide detoxification. A session with this penetrating heat is what provides the deep muscle relaxation and beneficial detoxifying effects of infrared possible. In 2015, the company upgraded its website and expanded its product lines which can now be a bit confusing. Here is a simple way to understand them. It had previously carried the Classic as its main line and now has three. Chromotherapy color lights are included as light therapy in its units. Renew – Renew is a new, lower entry line using both carbon panel and ceramic steel heaters (Renew 3 pictured above). The one person is the Renew 1. This is a much better alternative to inferior brands such as Rocky Mountain, Coastal or others. Definitely much better than the cheap recreational units such as Dynamic that are sold at large chain stores. However, a Vital Health or Clearlight would provide much more carbon panel coverage. There are a couple weaknesses we see in this new line. First is the lack of heaters on the sides of the interior. They are also missing from the front and also the sides of the legs as well. There is a carbon panel on the back and ceramic under the bench. The wooden slats are a little too wide which blocks a bit of the carbon heaters. Infrared does not penetrate through wood. Perhaps improvements will be made to this model in the future. As expected, craftsmanship is outstanding and the wood is top grade and beautiful. The Renew is its first attempt at carbon panels. It omits side heaters and front heaters which is disappointing. We have been in contact with them several times the past 2 months, however until we obtain more information on its direction, we recommend considering Heavenly Heat Sauna. Enrich Mate – High Quality line basically replacing and upgrading its previous Classic line. Uses several of their patented Tecoloy ceramic elements. Restore Mate – Large size units. The Conditioning pictured above is one of the Restore Mate models and allows for wheelchair entrance or yoga workouts. Another has two levels for multiple people. The third allows a person up to 6′ 5″ tall to recline. Essential Mate – These are lower body only units. The user sits down in an Essential Mate and their shoulders and head are basically out of the top of the unit. Refresh – These are specialty items such as feet-only units. Some of Health Mate Sauna accessories are pictured above including a sauna outdoor cover, seat cushion and shelf mate. While not the lowest in the industry, the EMF levels a few inches away from the heaters, where users sit, are at acceptable levels and far below the dangerous levels of most cheaper and a few expensive brands. Keep in mind that while high price cannot always be a good indicator of a safe product, a cheap price is almost certainly indicative of unsafe EMF levels. A safe EMF level is typically declared to be below 3.0 milligauss (mG). If you are concerned about deep healing and your overall health, it is very wise to avoid cheap brands. They may look similar to the better ones. But by providing you with little infrared therapy and at the same time exposing you to high levels of EMF, a cheap unit is neither a value nor a bargain. 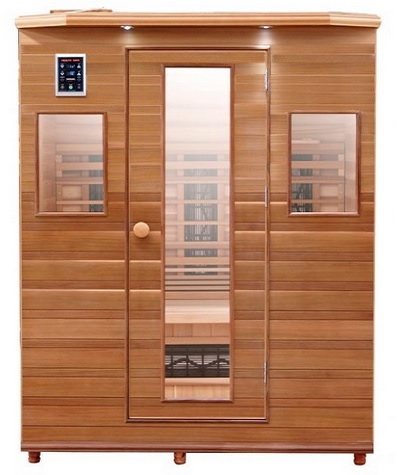 A Health Mate Sauna emf rating will certainly be much better than experienced in a $1500 product. Non-Toxic Wood and Quality Construction? Another plus is that Health Mate infrared saunas are constructed with only the finest, handpicked, materials, including the highest quality wood of traditional Western Red Cedar and Hemlock. 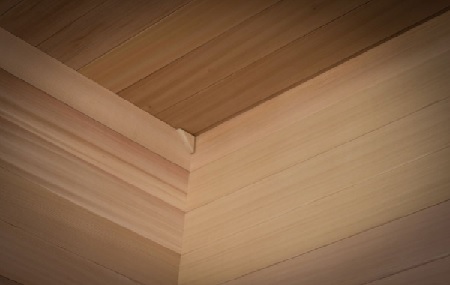 This wood is sourced directly from Canadian forests and transported to the company’s three hundred thousand square foot lumber mill for processing. Only the center cut of each log is used to produce the wood in your Health Mate sauna. In addition, each piece of this wood is individually inspected and hand selected for quality. You will likely not find defective pieces or knots in your Health Mate sauna. The wood is air dried for weeks and then kiln dried. This prevents cracking and splitting when it is later exposed to all of the heat cycles you will put it through over the many years of its service. Occasionally wipe the inside with a warm damp soft cloth using warm water only. Do not use cleaning products as the wood will absorb odors and chemicals from cleaning agents. Stains on the inside wood can be lightly sanded with fine grit sandpaper. Towels placed on the bench will prevent stains. Health Mate Sauna benefits include not only excellent craftsmanship, but also pain relief, lower blood pressure, detoxification, weight loss, stress reduction, improved skin condition and other personal wellness benefits infrared heat offers. Although there are no medical studies proving a heat therapy session with this brand will increase core body temperature, it is likely it will provide the temperature increase to promote healthy toxin-removing sweat and improve circulation. 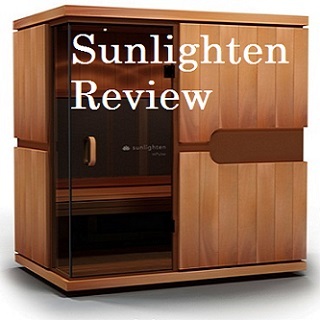 At this time, Sunlighten, Clearlight and Heavenly Heat have all been proven to increase core body temperature. Not really. It is rare to find Healthmate Sauna complaints online. This company avoids this by providing solid products. As you are in the market for a quality health product, Health Mate infrared saunas are a good choice. It is among our recommended brands and should be one of your considerations. It utilizes a patented, effective and safe heater in a cabin of quality selected wood, based on decades of manufacturing experience. It is no wonder why it has a history of so many satisfied customers. You consider your health to be your most important asset. A Health Mate sauna session will be in a quality far infrared sauna that will help you keep this asset safe, returning benefits for years to come. We also suggest you consider our top recommendations including Clearlight, Heavenly Heat, Sunlighten and Vital Health. © 2019 Healing Heat Therapy. All Rights Reserved.